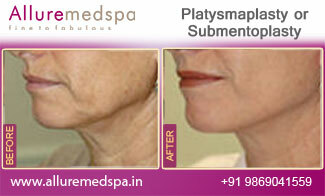 One of the areas that visually magnify the aging process is the neck. 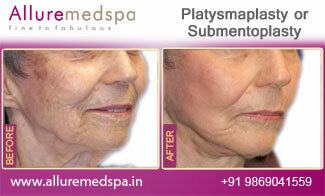 As you age, the skin in the face and the neck begin to sag. Even the neck muscles separate, which can cause a turkey neck “waddle.” But a platysma lift can reverse this process. Platysmaplasty literally means “reconstruction of the neck muscles,” and the platysmaplasty technique differs from all other neck lift approaches because it focuses on tightening the platysma muscle where it is the weakest—under the chin. Platysma lift is an extremely safe cosmetic procedure that can tighten the drooping (and age-enhancing) skin on your neck. In addition to sculpting the neck, a platysma lift can fix your double chin and redefine the jaw line, making you look years younger and its youth-enhancing effects can be dramatic. 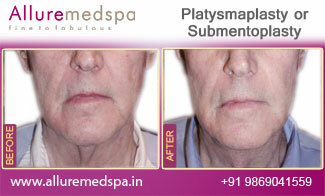 During the Platysmaplasty procedure, the doctor will make a small, horizontal incision, (discreetly concealed beneath the chin) through which he will join the two sides of the platysma muscle together to create a single muscular sheet that is resistant to the formation of neck bands and enhances the definition of the jawline and neck. The doctor will surgically excise the fat from the neck musculature using direct visualization. He will then perform central plication of the platysma, which involves tightening the weakened or stretched platysma with multiple rows of surgical stitches. This highly effective tightening technique is similar to that of lacing up a woman’s corset, and helps to create a taut, smooth muscle layer and a sharp transition between the neck and jaw, which translates to an improved neck angle and a more youthfully defined neck and jawline. This procedure generally takes between 2 and 3 hours to complete. At Allure MedSpa, celebrity surgeon Dr. Milan Doshi takes an extremely detailed approach to neck surgery. Through his many years of experience, he believes there is no such thing as a standard neck lift. Instead, every patient requires a thorough examination of his or her unique issues and anti-aging goals. Dr. Doshi’s approach to neck surgery is dynamic, integrating all areas of his facial plastic surgery expertise for the best outcomes. This can be performed under IV sedation. Recovery from a Platysmaplasty neck lift is relatively simple, necessitating only a few days of downtime. After surgery, patients can expect to experience some degree of bruising and swelling around the jaw, ears, and neck; however, any post-operative bruising should subside within a day or two of the procedure. Allure MedSpa which is renowned for its state-of-the-art internationally acclaimed services, offers affordable and cost effective cosmetic procedures. To know more about the cost of your procedure request a consult by filling the form below. Your consultation is your chance to ask questions about Neck Lift and put your mind at rest. Your surgeon will be able to offer you full explanations and answers to all of your queries. Alternatively, our counsellor will call you at your convenient time. Request a consultation right away: Book a councelling session. Loose, sagging neck skin associated with the dreaded “turkey wattle” appearance. Following your surgeon’s aftercare instructions will ensure a speedy recovery. We are pleased to offer and arrange comfortable lodging, restaurant, and commuting to ensure a memorable pre-and post-surgical experience for our out-of-country patients. Please feel free to contact the Counsellor +91 9869041559 for assistance with any of your travel and planning needs. As a result of the unique technical elements required for this neck lift technique, patients may initially experience a tight feeling in their neck after surgery—this sensation is completely normal and will gradually subside. Although a time consuming procedure, patients will benefit from the beautifully natural, long-term results produced by the corset platysmaplasty neck lift. The results of your Platysmaplasty neck lift will be visible immediately after surgery, and will continue to improve over the next 1-3 months. Are there scars after a neck lift? Though the incisions made for the neck lift will result in scars, they tend to be well-concealed as they are mainly located behind the ear and sometimes beneath the chin. When will I be able to return to work after undergoing a neck lift? Most patients are able to return to work within seven to ten days after the neck lift, sometimes sooner for those patients not bothered by residual swelling.